Good afternoon from vacation. We don’t need to talk about it. If you told me you were on a sunny beach with fine white silky sand between your toes, fluffy aqua waves lapping at the edges, palm trees swishing back and forth, scooping aquachiles onto tortilla chips and marveling at the range of available papaya hues while I was shoveling out snow for the nth time this year, I would smile politely and comment “How amazing!” on your Instagram but I would silently pout, as I probably will be a week from now. Let’s… not. 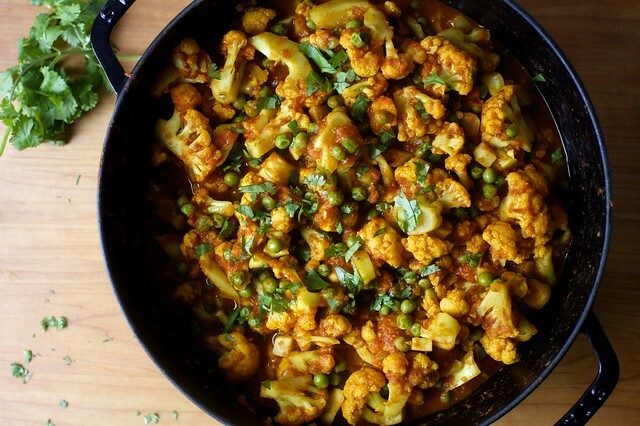 A week or so before I left, because the treadmill seems as good a place as any to think about what you want to eat next, I was overwhelmed with a craving for cauliflower cooked in a spicy tomato sauce. 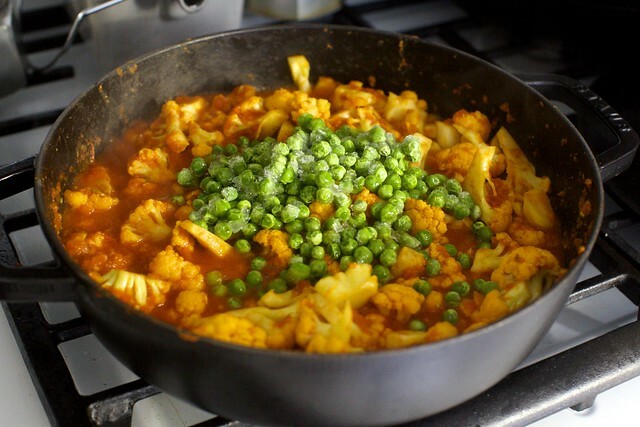 Gobi matar masala (cauliflower, peas, spices) is a a classic vegan North Indian recipe that fit the bill; the dotting of sweet peas adds is wonderfully complementary. When I came home and started looking through books and websites for recipes I realized that it’s more often a dry curry, made with a few tomatoes but most of the liquid evaporates, leaving a more concentrated mixture. The first time, I made it this way and it was fantastic, but my craving for a saucier version — more of a sabzi, if I understand correctly — remained. A friend confirmed that, like most traditional dishes, there’s no one agreed-upon way to make it and some days you may want it to be more of a stew than others. Feeling liberated, the next time I made it, I added a few cups of canned tomato puree and it was exactly what I’d hoped for. We ate it with rice but it would also be delicious with chapati, roti, or another flatbread. There’s a lot of flexibility here. You can keep the cauliflower more crisp or let it relax more in the masala, depending on your preference. You can use more or less tomatoes, depending on how saucy you want the dish. You can crank up the heat with more chiles or chile powder; my kids aren’t quite there (yet!). And if you’re missing a single spice, I wouldn’t sweat it. I took note of some of the most common spices used but then went recipe-free, just cooking and adjusting to taste (and jotting everything down, dutiful food blogger that I am). It was cozy and unheavy and perfect; I froze the leftovers and can’t wait to have at least one meal all squared away when we get home. 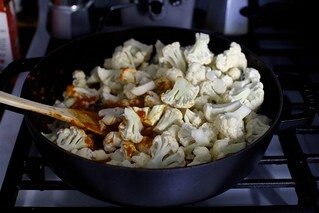 If you’d like to brown your cauliflower florets for a more nuanced flavor, you can do so in an additional tablespoon or two of oil in the beginning, with your frying pan on high heat. Scoop it out and set it aside before beginning the recipe as written. Once you add the cauliflower to the tomato sauce later in the recipe, you might need 5 minutes less cooking time to get it to a good consistency (I aim for tender but not mushy here). First, prepare your cauliflower, just to get it out of the way. Trim the leaves. Remove the large core and dice it into small (1/4 to 1/2-inch) pieces. Cut or break the florets into medium-sized chunks. 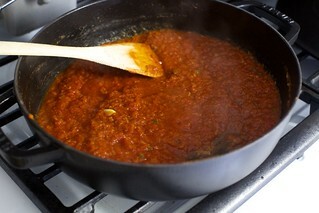 Then, in a large, deep sauté pan, heat oil over medium heat. Once hot, add cumin seeds, ginger, garlic, and jalapeño and cook together for 3 minutes, until tender but the garlic and ginger are not browned. Add diced cauliflower core and finely chopped cilantro stems (save leaves for the end) and cook for another 1 minute together. Add turmeric, chili powder, coriander, and garam masala and cook for 2 minutes. Add 2 to 3 cups tomato puree — use the smaller amount if your cauliflower clocks in in the 2 to 2.5-pound range, or if you’re not sure you want dish as saucy as mine is, plus salt (1 1/2 teaspoons was just right for my 3 cups puree), and water and bring to a simmer, cook for 5 minutes. Add cauliflower and stir to coat with sauce. 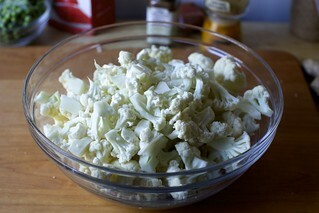 Cover with a lid and cook for about 20 minutes, until cauliflower is tender but not mushy, stirring occasionally. Add peas (still frozen are fine) and cook for 5 to 10 minutes, until heated through. Add amchur powder or lemon juice and stir to warm through. 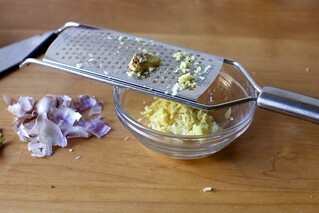 Taste dish for seasoning and adjust to taste. Finish with cilantro leaves. Serve with rice or flatbread. Mmmm! Thanks for this. This dish, in one guise or another, is one of my winter staples. Sometimes I add canned chickpeas, sometimes a potato, and sometimes, when my ultra-carnivorous husband looks at me skeptically when he sees what I’m up to, I even add chicken. Looks lovely. Question on tomato puree – do you mean a simple tomato sauce that’s usually sold canned or boxed? Here in the UK, ‘tomato puree’ generally describes the heavily concentrated stuff you get in a tube and 2-3 cups of that would be interesting! Ps if you don’t already have them I think you’ll love Meera Sodha’s books, Deb. No, she means tomatoes that have been puréed. If you can’t locate I would go with crushed tomatoes. The ones you’re describing as puréed tomatoes is called tomato paste in the US. I think the Brits call this product tomato passata – that’s what I’ve seen it called in recipes. It’s often sold in those box-like containers (one of which you can see in the second recipe in this post, Pomi brand in this case). It’s sieved tomato sauce. And I second the recommendation of Meera Sodha’s books! Fresh India, her first one I think, is my favorite. I love Meera Sodha’s books. Sabzi just means vegetables, cooked, but any style – it doesn’t denote saucier. Regardless, this looks delicious and super in line with my lazy-second-generation-Indian-home-cooking style! I even think my mom would approve ;) Side tip: do basically the same treatment with tomatoes, peas, and mushrooms for a mushroom matar – it will be unspeakably delicious! caveat to my own comment – i am not suggesting your recipe is “lazy” or inauthentic! that was supposed to be a compliment about your work to make indian food accessible to home cooks! This is my first visit to your site–I love it. I’ll be back to explore your other vegan recipes. I’m smitten (sorry, I couldn’t resist) with the pot you used to make this dish. Does it have a name? Or can you share a link? I think you’re right, June–I see the name now on the handles. Instead of serving with rice, could I add (waxy) potato to the stew? 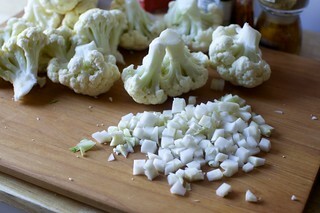 Diced small and added to the fry-pan before the cauliflower? Probably increase the liquid slightly to allow for cooking? I’m not Deb (duh..and I wish haha) but in my part of India, we add cut up potatoes to a curry of this sort. What would you suggest to replace peas? We hates them, precious. As an Indian who has grown up eating this dish every season, you can skip peas and add potatoes. During summers when green peas were out of season we would do potatoes or even totally skip it. Oh and this sabzi pairs beautifully with poori and cucumber raita. Very excited to make this! Just thought it’s worth a mention this could also be tagged as Gluten Free! 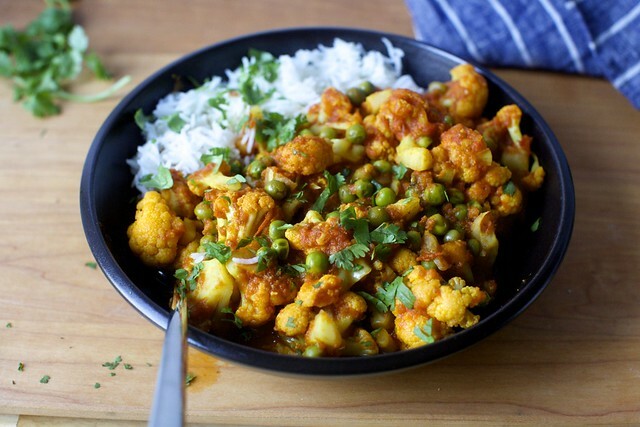 Hi Deb, this looks like an easy, delicious and authentic version of gobi matar. Just FYI, sabzi means ‘vegetables’ in Hindi. I haven’t heard it used to mean vegetable-based sauce, but I guess it could be. I make a lot of cauliflower-based dishes because my country (New Zealand) does great cold-weather vegetables. One of my favourites is to cut a cauliflower into florets and roast them with some baking spray, whole cumin seeds, and smoked paprika. Does anyone know how this could be done in a slow cooker? Just made this tonight with frozen cauliflower florets and it was delicious! Didn’t bother to thaw out the florets first – just dumped them in frozen. I cooked my florets (about 2-3 inches in length) for ~15 minutes total and ended up with a slightly firm/almost soft but not mushy texture. Hope this helps! Yes thank you! Got the ingredients and excited to try it! I always use frozen cauliflower for this type of dish and the texture comes out fine. I typically partially thaw the cauliflower in the microwave for a minute and then brown it in some hot oil with curry powder before proceeding with the recipe. I am one of those who cannot abide cilantro in any form whatsoever. Is there a good substitute for cilantro, or should I just leave it out? I also have some physical problems with food that is too spicy. Is this very spicy/hot, and will it completely spoil the dish to reduce the amount of peppers and chile powder? I admit to being a wimp, but I do love the taste of Indian food—just not so hot and spicy! LOL Thanks! I, too, can’t physically tolerate much heat and I have found that just leaving out the chilis and hot spices like cayenne or pepper flakes doesn’t ruin the dish’s overall flavor — just makes it edible for me. My husband who loves spice usually just adds a chopped pepper or dash of something equivalent to what I’ve had to leave out to his portion and we’re both happy. I also do not care for cilantro. When a recipe calls for it I will substitute it with parsley. Especially flat parsley works great! When ever a recipe calls for cilantro I will subside it with fresh parsley. Is the reason you don’t like cilantro because of the strong flavour (Australian spelling)? If you buy dried cilantro leaves in the spice isle you’ll find the flavour is not as strong as the fresh herb. Just curious if you tried that already. i like cilantro, but if i don’t have it in the fridge, i use parsley. green onions/scallions would probably be good, too. I’m a college student from Maine and have been reading Smitten for about six years (extremely enthusiastic fan/avid cook/baker), and although I have made many dishes from the blog, have only commented a few times. This dish is fantastic! Made to the letter (with the addition of chickpeas) for a warm, brightly flavoured dish enjoyed by everyone! Thank you so much Deb for this blog, it has brought me an incredible amount of joy over the years. Hi – I was just thinking about adding chickpeas and/or lentils to get some protein to the dish. Did you just put canned ones in at the end with the peas? Yes I just added a 15oz can with the peas at the end and let it all warm up :) Definitely a good addition, made it into more of a meal! Hi just to be clear you added chickpeas and the green peas to the recipe? I did yes – basically once everything was cooked, I added a can of chickpeas with the green peas (I used frozen) and cooked til they were warmed through, another 10 ish minutes. Suggested tag for this post: gluten-free. I love going through your GF tag, and this would be a great addition! Just delicious and extremely satisfying. Perfect for our no-meat night dinners. Used a 2 lb cauliflower with a 14.5 oz can of fire roasted tomatoes. Sauce to cauliflower ratio was perfect. Enough for 2 with leftovers. Sounds delicious! I’ll be making this tonight! I made this last week and had to come back and rave about it! The whole family loved it! I’ll be making this again! Folks have no idea just how delicious vegan meals can be…Delicious meal! Thanks so much! I made this for dinner tonight and it was fantastic! Served with rice and daal. This looks absolutely delicious, can wait to try it! I love Jalapeno’s so it sounds like it has a nice kick! This looks great! I’ll definitely be giving this a go. This dish is delicious! I made it for family dinner last night, served it with naan and it was a succes. Was hoping for some leftovers but… no luck. I did go easy on the chili powder because of the kids but next time I might switch it up a bit after all. Absolutely delicious but the 1/2 lemon was a bit too much acid for us. Is there a volume amount for lemon juice that would work better and be more in line with the amchur (since all lemons release a different amount of juice)? This was a delicious dinner, with basmati rice. I added shrimp because my daughter wanted some protein and shrimp seemed like an easy add (used a bag of frozen peeled deveined shrimp), and green beans when I added the cauliflower. It reminded me of shrimp creole, Indian style. I wasn’t sure about the chili powder, so I used the stuff I have for chili recipes. It seemed fine though I’d love to know whether there are chili powders used specifically for Indian cooking. Really delicious and fun to make. The spices made the kitchen smell wonderful. The lemon at the end perks the whole dish up. As a cilantro lover, I liked the two ways it is in the recipe. Highly recommended! This looks amazing. Looking forward to making this at the weekend! This was delicious and really hit the spot on a snowy winter’s day! I served it as a main dish over rice, but it would be equally good as a side, maybe served with Indian-spiced sheet pan chicken. My cauliflower was on the small side, so I added a can of drained and rinsed chickpeas for volume, and 2 cups of tomato puree was plenty. Thank you for great recipe! Made this, it was fabulous. This looks really good, such a big fan of masala. Will definitely give this a try later in the week! Ohh this is an awesome post. Pls keep it up. This is very delicious and turned out amazing. But I added a little more turmeric, Cumin and ginger. I love strong flavors. Holy cow- this was utterly delicious! I made this exactly as written, except at the end I added some panner that I had pan fried, and a little teaspoon of butter at the end to finish it. Served it with some tomato and cucumber raita. Wooooo! Killer recipe, thank you. This one is going in the rotation! Thanks for sharing such a delicious recipe. I love Indian Food. Made this with potato instead of peas. Diced up the potatoes and added at the same time as the cauliflower core. Put in the entire can of tomato (used crushed tomato). So yummy! Had it over rice. Looks so yummy! Gonna try it. Thank you! We made this tonight for an openhouse at a local community center and fed 50 happy people! In lack of giant pots and pans we roasted the cauliflower in the oven and then tossed it in the tomatosauce. Thanks for sharing the recipe idea. Looks really awesome. Sharing it! Made this last night and it was quite tasty! Such a good weeknight dish. I would maybe add a bit of butter or cream at the end to round out the flavor profile. Also it was a little tomato-y. I used San Marzano pureed tomatoes and would do a canned tomato that’s less pronounced flavor-wise next time. thanku so much for sharing this racipe . this racipe will help me in making Cauliflower and Tomato Masala with Peas (Gobi Matar). thanku…. I was not a fan of this version of masala…found the combo of seasonings to be off and tomato purée, sickly sweet. I usually read over a couple of recipes and cherry pick best flavors, but made this as printed. (With addition of chickpeas as my cauliflower was small) Lots of leftovers, hoping the flavors are melding as I write and second time around will be more pleasing. We made this tonight and it was lovely. I doubled the ginger and garlic, because I was using pre-prepped from Aldi. I also left out the cup of water for a thicker sauce and that worked perfectly. I forgot to add the lemon juice, but it was tasty without it. The roommate has demanded that this go on regular rotation. It’s an unqualified hit. So I am dairy free ever since I had my second child a bit over a year ago. I’m not much of a cook either because boy does it take a lot of time to make some great dishes. But this dish is a-m-a-z-i-n-g. My 5 year old needs to be tricked into trying veggies EXCEPT when tomato sauce is involved, then she will gobble it up. I love how she can get so many nutrients with this dish! We also live in Germany and a lot of these items are super easy to find when we travel around Europe, sometimes we stay at places where we have use of a stovetop and oh gosh its always good to have an easy recipe like this that we can ACTUALLY find in France or the Netherlands. thanku for sharing this useful racipe. this racipe will help me in how to make cauliflower and tomato masala with peas. My husband won’t eat cauliflower, so I made this with broccoli instead. Still delicious! Just thought I’d mention that in case anyone else was wondering if it would work with this switch. Thank you! I detest cauliflower on a very deep level (I can’t even deal wit the smell), and was perusing to see if anyone had tried a variation on that (important) ingredient. Thank you very much for this excellent recipe! Made this yesterday and we loved it. Thank you for the recipe – this was great and made wonderful lunch leftovers for the week. Like some others, I added a can of chickpeas with the peas at the end. I also added a few handfuls of baby spinach with the peas for a bit more green. I used the entire can of tomato puree. I generally prefer a lot of flavor and spice so I did 1 jalapeno and 1 serrano and then doubled the dried spices. Thanks again! Awesome recipe. I made it for my parents, who are born/raised in India, and they loved it. The cauliflower was perfectly crisp/tender when cooked as directed, even though it sat in the pot for 1-2 hours before we ate it. I used one serrano chile which was spicy- for milder palates, I would use 1/2 serrano, deseeded, instead. this looks really nice. I’ve been trying to eat more vegetables. This one would be a good choice to make! This was outstanding, I had to use frozen cauli because we’re 4 hrs round trip to the grocery store ( BC mountains, LOL) but it’s a keeper. And I have just realized how many of your recipes have become a staple in my house…fudge sauce, cauliflower fritters, black bean feta tacos, red bean curry, apple spice cake, ginger-carrot salad dressing and more. You have been a go to for kid food too . Always a great read, thank you! Healthy, comforting, warm… I can’t wait to eat the leftovers for lunch today. Next time I’ll add paneer or maybe try the recommendation of chickpeas to make it more substantial. 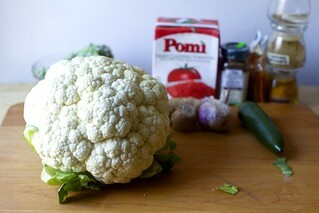 It is also delicious as-is, and I love that Deb uses the whole cauliflower head, core and all. That looks good. I’ll have to try it. I once made aloo gobi with sweet potatoes — definitely worth doing again. Thanks for this recipe. This is something I can prepare really fast for my family especially on those days when I’m very tired. I like its simplicity yet nutritious and looks delicious too. I will try this today. Outstanding recipe. I did add the chickpeas at the end and served it on spiralized baked butternut squash, Such great flavours! Can’t wait for the leftovers tomorrow. This looks beautiful, I love the combo of curry, chickpea and couliflower. perfect! My husband doesn’t like spices these overwhelm the food. Sigh. But, all the things going on in this even with only garlic and some chili powder and a tiny bit of cream masala, this is crazy good! Thanks! this is the 2nd time I have made this dish, it is spectacular. I followed the recipe as written and family loves loves loves it. Deb never disappoints.